So last summer, Faolan pooped in the Jeep. It was a cool day, I was at a friend's house, and left him in there for five minutes. And he pooped. (If you're interested, the friend's house I was at runs a non-profit SAR group. Check them out!) Anyways, she helped me to clean it up as best we could, but some of the poop got ground into the carpet in the cargo area. So it was a lot of fun cleaning it out once we got back to the house. Anyways, between poop, pee, fur, drool, and three large, furry dogs, it is quite apparent that I need a cargo liner. Enter Solvit and their Waterproof Sta-Put SUV Cargo Liner. I am a fan of the company, owning one of their large dog ramps. I love that they encourage owners to have active lives with their dogs. The liner is designed to fit the largest of SUV's, and can easily be used for smaller SUV's. It could also be used to cover the backseat of a car. When I am travelling with my dogs, I fold the back seats of my Forester down, and the liner covers nearly the entire area. When the seats are returned to their original position, it stays put. The cargo liner is held in place by pieces of velcro that will adhere to the fabric/carpet in cargo areas, but is also easily removed. It's waterproof. See above for why this is a good thing. Fur can easily be swept or vacuumed out, instead of weaving itself into the fabric or carpet fibers. It stays in place, but is easily removable. It is a nice neutral color, and I don't mind leaving it in my car when I'm driving around without a canine copilot. I am a fan of the cargo liner. Perhaps now I can attempt to remove the fur that is seemingly reproducing in my cargo area, and feel confident that a minimal amount will now be present. I am hopeful to never again know the struggle of removing poop and/or pee from the carpet of my cargo area. 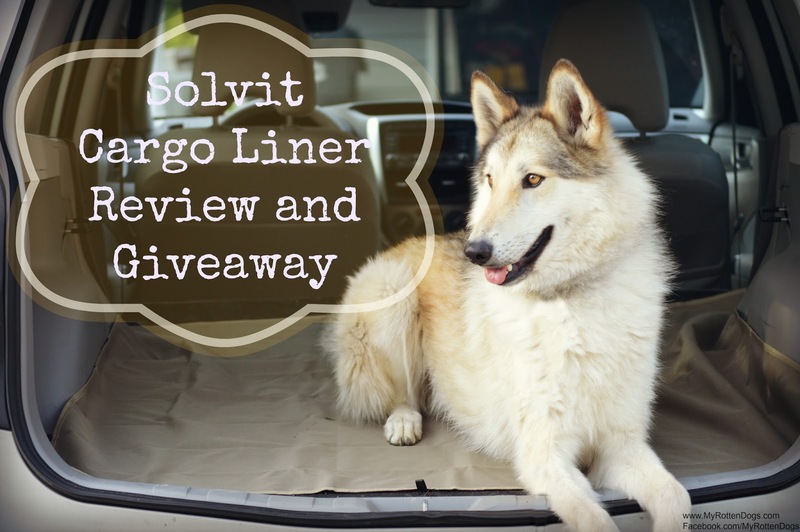 Solvit is giving away a Sta-Put Waterproof SUV Cargo Liner to one reader! Enter using the widget below. 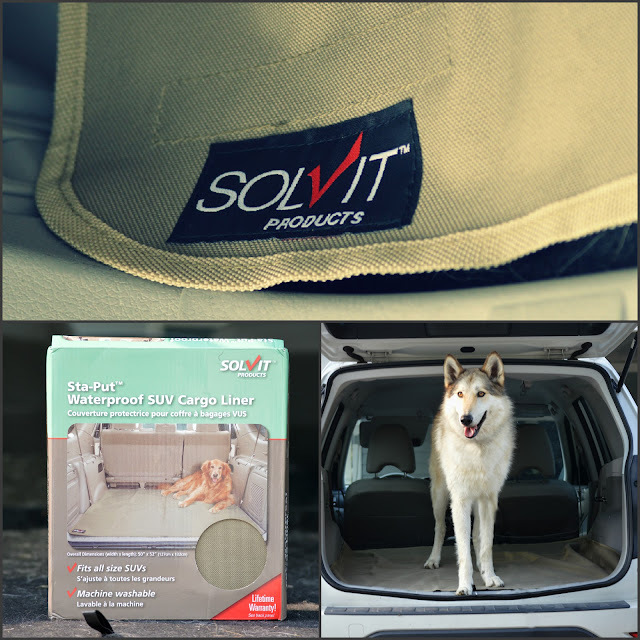 This post and giveaway are sponsored by Solvit. Solvit is not responsible for the content of this post. Okay, I know I needed to comment on the Cargo-liner... but those specimens (Drool, fur and other stuff) just made my day! That looks like a great cargo liner. Mom will NEVER forget the day she was bringing Phantom home from one of his grooming visits. When she got in the car with him, he started to whine and whine as she drove along a very busy street. It had started to snow and she didn't have her boots on. She is so afraid of falling and breaking her fragile bones that she decided to keep goin. Home was less than five minutes away. Poor Phantom couldn't wait - he had terrible diarrhea and it landed in every crack and crevice of the seat belt holes and all over the seats and carpet of Mom's less than a month old new Toyota Highlander.It took a heavy industrial cleaning at the detailing shop and almost $500 to get the smell out. How very helpful one of these liners would have been!!! Poor Phantom was absolutely mortified at what he had done, but it was truly beyond his control. I like the stairs , they would be great for my old furkid to get on the couch. The rear only lifting harness would be nice. I have a Corgi with DM. I love the HomeAway™ Travel Organizer Kit. Looks fantastic! And omg pooped in your jeep? EEEEEK! Is this giveaway open in Canada too or no? I'd love the HoundAbout II™ Bicycle Trailer and Travel Organizer Kit. I'm really interested in a ramp. I would like to have the large Mr. Herzher's Deluxe Wicker Residence for my dog.